Clooney continues to tread a different path, here directing, co-writing and starring in another film that multiplex audiences may largely ignore, due to it’s political themed story. Governer Mike Morris (Clooney) is engaged in a ferocious run off battle with his rival to seal the Democratic nomination. Next stop the presidency, as the Republican candidate is considered a “dead duck”. Running the campaign for Morris is Paul (Phillip Seymour Hoffman), ably assisted by his press spin doctor Stephen (Ryan Gosling). A person who can manipulate the press pool without them even realising they are being managed. Morris is affable, telegenic and according to Stephen, the “real deal”. Paul just wants a win to add to his already impressive career, his ideals have long ago been crushed and packed away. On the opposing side is Tom (Paul Giamatti). Both campaign managers are desperately struggling to obtain the endorsement of Senator Thompson (Jeffrey Wright), a boost that would take them past the delegates required winning post. Of course nothing in politics is free, such endorsement comes with strings attached. The inner workings of a campaign are shown slickly and believably, with Ida Horowicz (Marisa Tomei) a print journalist, hovering like a circling vulture alert for any misstep or scandal. Stephen skillfully keeps her at arms length, a mutual distrust exists between them, which suits both until events transpire to alter the balance of power. Most of the audience for such a film will appreciate and not be surprised at the level of cynicism on offer. Politics is the dirtiest of businesses, integrity and beliefs ready to be traded as and when required, to achieve the only desired result, winning and subsequent power. To what lengths will candidates go to win, every and any would be the message carried through the film. It would be foolish to bet that real life is any different. 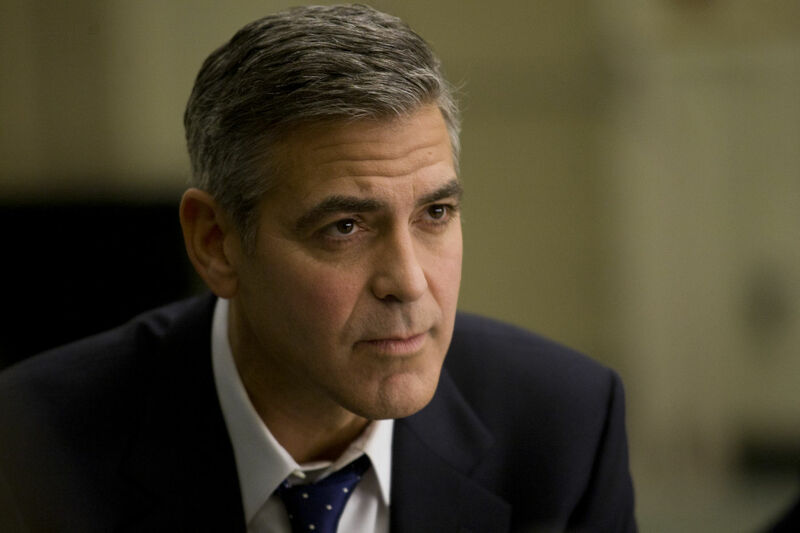 Clooney is strong, his character is both believable and delicately played. As you would expect Giamatti and Seymour-Hoffman are as solid and dependable as ever. Gosling continues to impress with yet another solid performance, more than holding his own with the talent on display. Molly (Evan Rachel Wood) as a new intern, certainly makes an impression, catching Stephens eye and firmly placing herself at the centre of the storm as the story unfolds. Clooney is dealing here in a very murky world where there are infinite shades of grey. There is no right or wrong, just choices to be made. Bearing in mind he is the star and director, it is rare to see the central performance being handed to a supporting role, Gosling who does not disappoint. The ending has a rather satisfying ambivalence, that may intrigue or frustrate viewers in equal measure. There is no real action on display, this is not that type of film but the story does break free from it’s stage-bound background, just enough to open up the story. Goslings character is perhaps a little young and in his character’s position, one might assume any idealism would have been snuffed out long ago. The content will no doubt limit it’s appeal, there is a element of preaching to the converted. For example, you probably need to be interested enough in the subject matter to want to enjoy the story, therefore the cynicism on display should come as no surprise. Based on the play “Farragut North” by Beau Willimon. A smart intelligent political thriller, with top notch performances, again highlighting the inherent shallowness of modern political campaigns.